· Furniture, bedding and home textiles in *TIFF Zone*. *The Niche Showcase Zone* features thoughtfully-designed products catering for particular market segments including: 60+ products for Grand Generation, Mom & Kids products, Pets products and best design of locally-made-and-marketed OTOP products. *There are Special Exhibitions and Initiatives* including *The New Faces Zone *which offers opportunity for new entrepreneurs to showcase their creations. *Pattern Creator and Functional Textile exhibitions* highlight the high caliber of Thai textile designers and manufactures in combining originality and creativity with innovation to meet global consumers demands. *Art Zone *brings rare art pieces from renowned Thai artists to delight and inspire visitors. *Hospitality & **Home (H&H) *showcases furniture, decors for hotels and accommodations exhibited at the Salone Del Mobile 2019 in Italy. 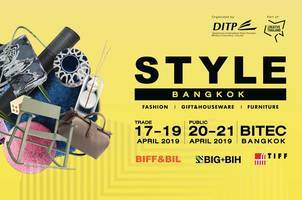 *Designers' Room and Talent Thai 2019* showcases creative works from talented Thai designers. *Innovation and Design Showcase *brings forth the innovative and design products in Thai industry. *Innovation and Design Bazaar* engages entrepreneurs and start-ups to participate in business matching to leverage marketing opportunity. *Innovation plus Design Style Cafe* caters to innovative and environmental-friendly products in the relaxing cafe-style atmosphere. *DITP Logistic Pavilion *offers on-site advice on trade logistics with professional delivery service and other related businesses.